Not much news to report today, except Tia continues to lose the fur around the tumor site and the side effects are lessening slowly. Tomorrow we start reducing her prednisone. I've already lowered her pain meds and she seems to be ok. These photos aren't very good, but you can sort of see how she is coming along. 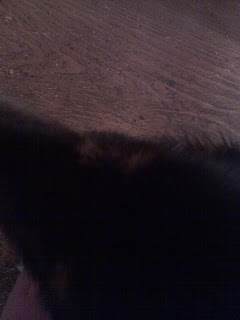 The photo above shows some of her hair loss in the tumor area. The photo below was taken looking down over the top of her head. There is a slight bump visible on her profile, but nothing like it was about 10 days ago. 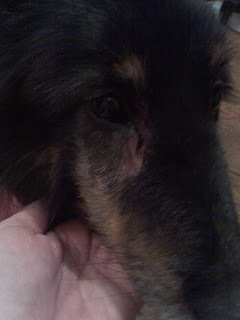 The surface of the skin on her face actually looks worse now even though the tumor has decreased in size, but Dr. Rosen assures us everything that is happening is normal. Tia continues on her liquid diet which she doesn't seem to mind at all. The thing that she does mind terribly is that Rick doesn't give her treats while he is cooking! She stands right by his side and looks up longingly, waiting for him to throw her something. We can't give her anything solid yet, until the hole in her mouth begins to heal. Poor Tia! I went to Sweet Pea in South Windsor to buy more canned food for Tia last night. Did you know that they actually make the equivalent of Ensure for dogs and cats?! I've been kidding about making her Ensure meals by putting canned dog food and water through the food processor, and was quite amused to find that there is a special product just for them. She looks pretty good to me. The main thing is she is home and the worst is over. And she is doing GREAT, all things considered!